We need your support for Mattesu Suresh who hails from a tribal hamlet in Vizianagaram District. 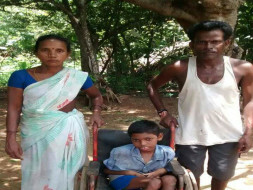 The boy is a victim of Cerebral Palsy and suffers from 90% permanent disability. Suresh's parents are illiterate agricultural laborers. They are usually migrant. But because of Suresh's disability, they are unable to go outside hamlet. Suresh has one sister. His parents are so poor that they cannot afford milk nor make him travel to any special and inclusive therapist. We need your support for his wheelchair (Rs 12,000) good clothes (Rs 2000) and nutrition (Rs 11000 p.a.) to start with. We also need around Rs 5000 for Physiotherapy.